4 oz $13.75 NO PRESERVATIVES. 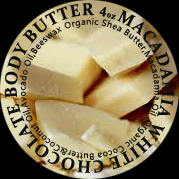 Ingredients: Organic Shea Butter / Macadamia Nut Oil / Organic Cocoa Butter / Organic Coconut oil / Avocado Oil / Beeswax. All our Body Butters can be used on the face, but this one is especially good for dehydrated skin with fine lines. This butter is extracted from the seeds of the Karite Tree (Butyrospermum Parkii). From these seeds a soft, pliant “butter” is pressed. Our Organic Shea Butter provides the highest level of benefits, as Organic means that: no pesticides were used during farming, and no chemicals were used to extract the Shea Butter. Anti-inflammatory Shea Butter: soothes irritated skin such as – burns / eczema / psoriasis / rashes / scars / dermatitis. Shea is rich in antioxidant phenols (like green tea), phytosterols, moisture-locking allantoin, Vitamins A, E and D, and Essential fatty acids – all of which fight free radicals – which are the cause of wrinkles, and many other skin ailments. Macadamia is regenerative, and has been successfully used to speed healing of scars. High in Mono-unsaturated fatty acids, Vitamin A and E, it creates the perfect environment for scar healing. As we age, our skin contains lessened amounts of Palmitoleic acid, which is responsible for delaying cell aging. Macadamia replenishes the skin with Palmitoleic acid (Omega 7). Macadamia Butter thus delays cellular ageing. Omega 3 and Omega 6 fatty acids in Macadamia Butter, promote youthful, soft, and supple skin. ♥ IF YOU SUFFER FROM EXTREMELY DRY SKIN, use it as a body moisturizer. Best effects are obtained when applying it directly after a hot bath or shower, when the skin is still damp. ♥ If you have dry lips, brittle hair or splitting nail cuticles, rub Macadamia White Chocolate Body Butter onto the affected areas. Both are well known for their richness in fatty acids and proteins, which help to prevent cracked skin, stretch marks, and dehydrated skin and hair. The best moisturizer for dry hands, especially when the top of your hands have fine lines, is Macadamia White Chocolate Body Butter.